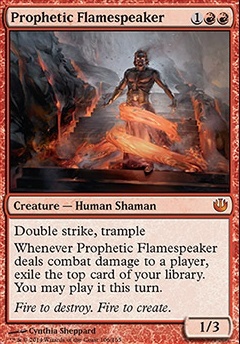 how does the exiling of cards work with prophetic flamespeaker doublestrike? Can you exile two cards with Prophetic Flamespeaker if it is left unblocked? 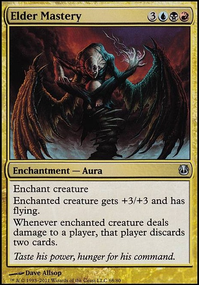 I've seen many Hollow One variants and play one, but I've never seen one use Measure of Wickedness, I like the idea behind it, but I don't like that you warped the deck slightly (Shriekhorn) to enable it or that it costs 4 to cast... 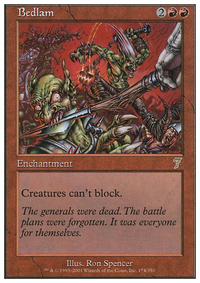 If I was using it, I'd add Furyblade Vampire and cut Grisly Survivor and Shriekhorn, Furyblade is a free discard outlet, with a reasonable upside. Your also running too many creatures with Delve, the normal Hollow One deck which runs fetch lands still only runs 4 delve creature, so -2 Gurmag Angler, -2 Tombstalker +2 Flameblade Adept and +2 Flamewake Phoenix. 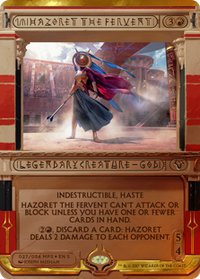 I'd only use Immortal Coil if I had something like Rakdos Charm (artifact destruction) in the deck, it's a massive risk. I probably prefer Sword-Point Diplomacy and Risk Factor to Dark Deal, which is card disadvantage and can only be played turn 3 when your hand could be almost empty. Lands, your not running fetches so why run Blood Crypt? Budget wise removing the crypt would more than cover 4x Dragonskull Summit and 4x Foreboding Ruins, importantly this would let you cut the number of swamps. This is essentially a red deck for the first 2 turns, no matter what the colour wheel says, mana sources that don't provide red should be kept to a minimum. If you don't have a red source in your opening hand then you need to muligan. I hope this is of help, have fun and good luck with your brew. lagotripha on Double Striking Funtime! Ok, some cards that will really help. If you want a red 2 drop that pumps your creatures permanently, Curse of Stalked Prey is great. Apostle's Blessing, for all them Path to Exile etc. Prophetic Flamespeaker is ok if you go more towards midrange. Scourge Wolf - cheaper than instigator. 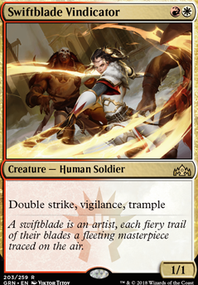 The traditional efficient double strike tools are Assault Strobe and Temur Battle Rage, with dipping into R/W for Boros Charm, which means that double strike on creatures themselves will always be a good pick for budget lists. 1) 3.5. 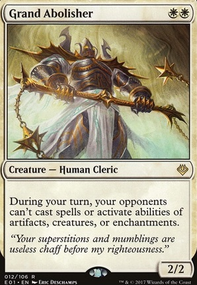 Skullclamp is really good in just about any token, sac or equipment deck. 2) 4. The only thing holding this back is the price. 3) 3. Not bad. The fact that you have to pay every time is annoying. Not quite as good as number 1. 4) 2.5. Not a huge fan. This basically eats up half your mana base and makes you the target of Strip Mines. 5) 2.5. Mask of Memory is pretty decent. Middle of the road. 6) 3. Solid. I like it. 7) 3. Good plan, Lifegain to mitigate paying life. Best with Necropotence. 8) 2. Still helps opponents, and normally discard outlets are useless without the deck being built around them. 9) 2. Tower of Fortunes is not really good if you don't have insane ramp. Better options out there. 11) 1. Just play Phyrexian Arena. Use Strionic Resonator for bigger trigger effects. 12) 2. Well of Lost Dreams is actually pretty good, but there are better lifegain effects than Peace of Mind. I like Inventors' Fair. 13) 2.5. You have to be pretty desperate to use this but it seems like it'd be okay sometimes. 14) 3.5. Tribal is always powerful. 15) 2.5. It's okay, kinda easy to interupt. 16) 3.5. I love Infiltration Lens! 17) 1. Little too janky and helps opponents. 18) 4. Because Slate of Ancestry is so good. 19) 1. I feel like there are better ways to repeat wheels. This one costs too much. 20) 5. My all time personal favorite. Humble Defector is good alone and my top two-drop in all my Boros/red decks. 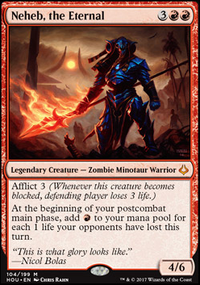 So again, from a strictly Boros perspective, those are my thoughts. I'm sure you can see the biases and the ones I've actually tested haha! Hope some of this helps. This will be a good resource!